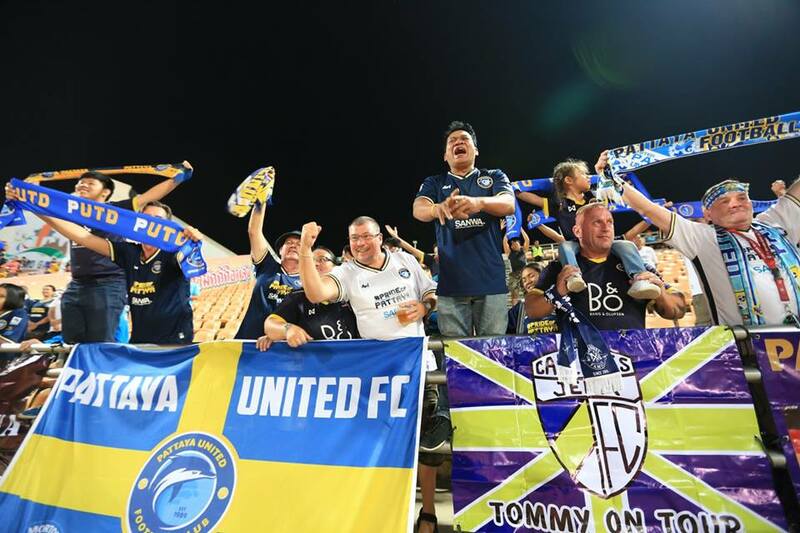 Pattaya United made their third road trip in four weeks on Saturday, March 4, to visit the 80th Birthday Stadium in Korat, the home of Nakhon Ratchasima Mazda FC. The hosts were unbeaten in their first 3 games of the season so this was not going to be an easy fixture for United as they looked for their first away points of the season. Pattaya changed the shape of their side with Milos Stojanovic being left on the bench and Wellington Priori playing as the lone striker. Although this did not appear to be the most attacking of options, the players bought into the new shape introduced by the coaching staff. From the first whistle United took control of possession and going forward they were given many options as the midfield worked tirelessly to support the loan striker. It was of no surprise when in the 13th minute the away team took the lead. The build up to the goal was superb, with Surachet Ngamtip threading the ball through a defenders legs for Chayawut Srinawong to whip in a wonderful cross and give Wellington the easiest of headers to open his season’s account. There is no doubt that Wellington Priori has the X factor. At times he looks as stable as Bambi on an ice rink, but out of nowhere he will suddenly produce a moment of magic that will bamboozle the most cynical of defenders. 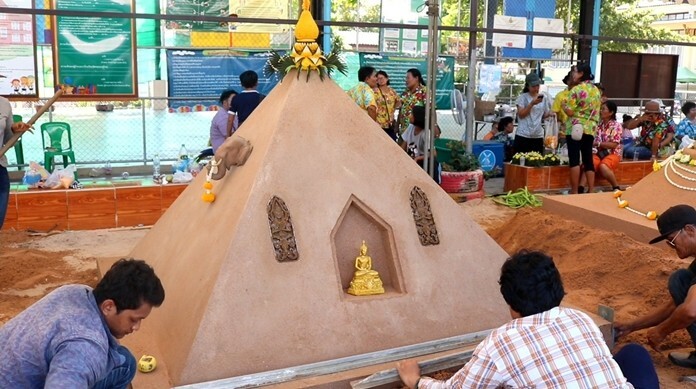 With Pattaya going ahead the home side tried desperately to get back into the game with a more direct method. United were still playing beautifully and could have easily increased their lead further, but in the 35th minute a bouncing ball in the area struck the arm of Peeradol Chamrasamee and the referee deemed this as a deliberate action. The ensuing penalty was expertly put away by Krest Velkoski and Pattaya went into half time rather unfortunate to only being level. This was the third away game in a row where Pattaya have been level at half time and on the previous two occasions the games had ended in defeat. Despite starting the second period strongly, the negative early season trend looked set to continue when in the 57th minute a breakaway resulted in Krest Velkoski notching his second goal of the game. 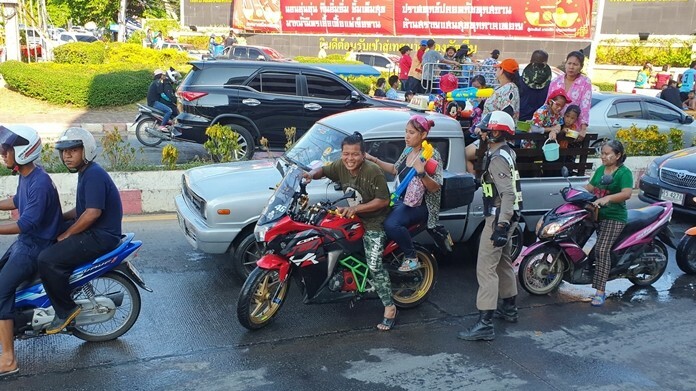 His task was made easier as Pattaya keeper Somporn Yos seemed rooted to his line and once again the Dolphins looked set to be returning south pointless. Pressing hard to get the equalizer, Pattaya missed several good opportunities with the best one falling to Chayawat Buran who blazed over the bar when it appeared easier to score. However, this miss can’t overshadow his general performance as he was a constant danger to the home defense. In the 77th minute Pattaya got their just rewards when a bouncing ball in Nakhon’s area fell to the feet of substitute Milos Stojanovic. Not needing a second invitation Milos smashed the ball home to get Pattaya level. The remaining minutes saw both sides going all out for victory in a very entertaining finale. Sadly the game ended in controversy when Pattaya skipper Lee Won Young became the third Pattaya player this season to see red. The captain has led by example early season but he will not look back in pride with this dismissal. After he received a slap in the face from Dominic Adiyiah he then threw himself to the floor with such authenticity one would have thought that he had been struck on the jaw by Anthony Joshua’s finest. A big melee followed and the referee had no other option but to send both players off the field. It was a shame that the game ended on a sour note but it should not detract from the excellence of the Pattaya performance. 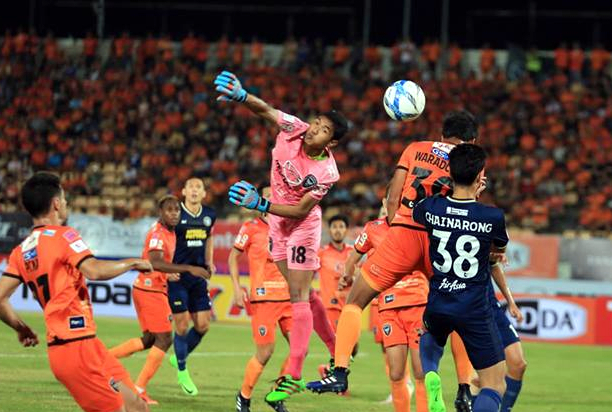 Both Chayawut Srinawong and Peeradol Chamrasamee were outstanding for the Dolphins and the away side can justifiably feel aggrieved have headed home with just the one point from the game. Pattaya were due to take on league leaders Muang Thong United at home on Wednesday this week and will next face Samut Prakan FC at the Loso-D Stadium on Sunday, March 12.